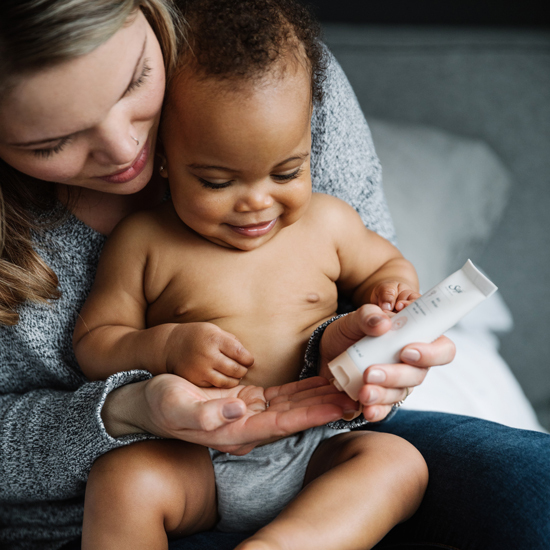 Soothe your little one’s sensitive skin with this all-over intensive moisturizer. Conditioning coconut oil and calming calendula work together to reduce redness and provide protection from further dryness. Apply topically, as needed to affected areas to protect and soothe sensitive skin from dryness. For external use only. If swallowed, seek urgent care. Keep out of reach of children, except under adult supervision. Do not use near eyes. If contact occurs, rinse with vegetable oil. If allergic reaction occurs, stop use and consult a health care practitioner. Soothes and gently hydrates dry and delicate skin. Nutrient- and antioxidant-rich; softens, hydrates and renews the skin. Apply as often as needed to protect and soothe sensitive skin from dryness. Recommended for dry or irritated spots that can appear on your baby’s face, scalp, body and bottom. Extracted from the bright yellow and orange marigold flowers and infused in olive oil, calendula is an emollient that gently hydrates dry and delicate skin. I love this product! I do wish it came in a larger tube. I will be buying a few more tubes of this!